Coins are great devices used in a lot of different Dynamics problems, mostly because they are fairly easy to model and solve analytically. This however was once I hadn't seen anyone put a lot of time into before. Ohk... So the actual question asked at this Physics Forum on Stack Exchange reads a little different. However the results answer my question much better. 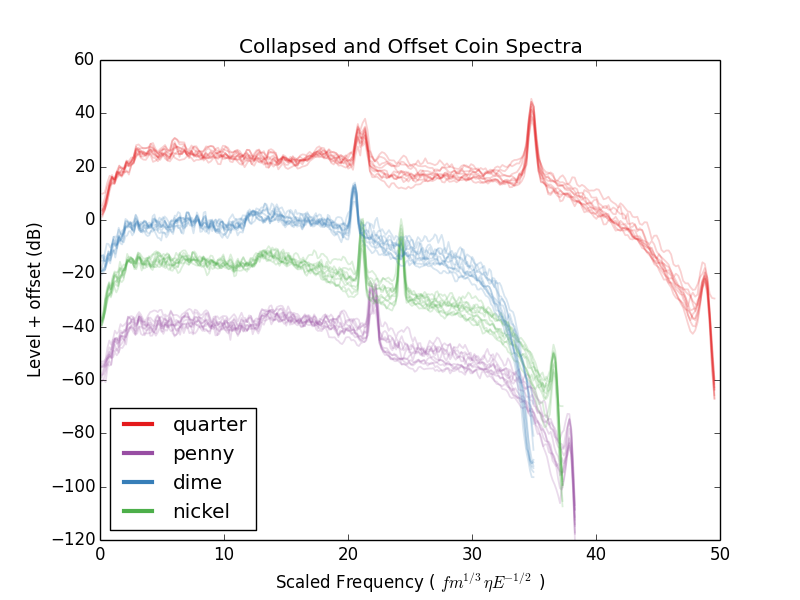 Each coin, having slightly different mass and stiffness characteristics, has slightly different resonant frequencies. Dropping a coin is very similar to performing a modal impact test. A coin, being almost completely flat surface, is a very good radiator of sound. The spectra shown above show different peaks that are indicative of the resonances (for indeed, most structure have multiple natural frequencies of vibration). Each of these peaks has a characteristic motion for the coin. This motion is called a mode shape, and flat panels and coins are very well understood geometries where this can be analyzed.